Former Chester City player Steve Fox died earlier this month at the age of 54 after suffering with cancer. 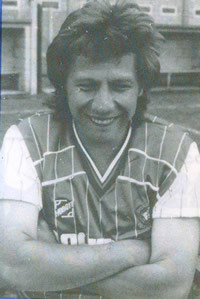 The Tamworth-born right-winger appeared 37 times for the club between 1984 and 1985 scoring five goals. After playing schoolboy football with Aston Villa Steve played for Tamworth at the age of 15 before signing apprentice terms with Birmingham City in 1974. He spent four years at St Andrews, mainly as understudy to Trevor Francis, and made his Football League debut for the Midlands side against West Bromwich Albion in February 1977. Steve went on to make 29 appearances at Birmingham before a £95,000 move to Wrexham where he spent four successful years. Financial problems at Wrexham, following their relegation, saw him sign for John McGrath at Port Vale on a free transfer in 1982. He helped the Valiants to promotion in his first season and was voted into the PFA’s Division Four team of the year. He was a regular at Vale in 1983/84 until falling out of favour following the sacking of McGrath and he moved to Chester during summer 1984 to link up with his former boss who by now had moved on to Sealand Road. Steve made his City debut in the first game of the 1984/85 season, a 1-1 draw with Scunthorpe, and scored his first goal in a 2-0 home victory over Halifax in October. That win was the last for McGrath and ten games without a win saw the manager sacked with Mick Speight taking over as caretaker manager. One of Speight’s first moves was to bring in Stuart Rimmer on loan from Everton with the result that Steve lost his place in the side. However he regained his place in April, alongside Rimmer, as Chester won five of the last seven games. During the summer Speight was replaced by Harry McNally but a clash of personalities saw Steve leave Sealand Road in October after only featuring in the first game of the season against Halifax. After leaving Chester the right-winger moved into non-league football with Tamworth, Rhyl and Llangollen.